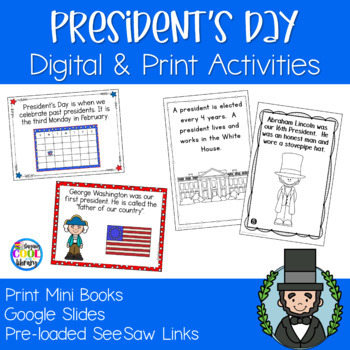 Teach your primary students about Presidents including George Washington and Abraham Lincoln with these emergent readers or informational readers. 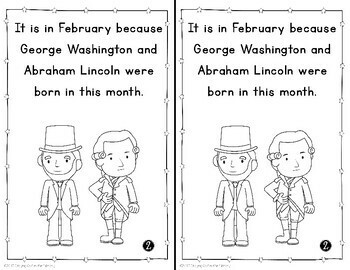 The first mini book is about President's Day and includes some basic facts about the holiday. There are six pages (including the cover page). It comes in color and black and white. The second book called Washington and Lincoln. 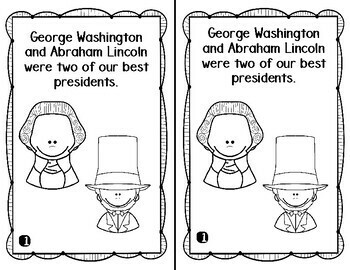 It gives some basic facts and information about these two presidents. There are 9 pages including the cover page. It comes in black and white and color The worksheet is a cut and paste to match a simple sentence to the picture. The preview shows almost every page of the file, I did take out some of the duplicate pages (only included a color or b/w page).